Facebook: This is a GREAT economical remote/keyboard for computers! Facebook necessity. Works on everything!! Item 875: $29.99Can or $23.25us Brand New. mouse and keyboard without the need for wires or a flat surface to operate upon. Facebook, sending emails or writing full page documents. Fat fingers can type fast on this remote. 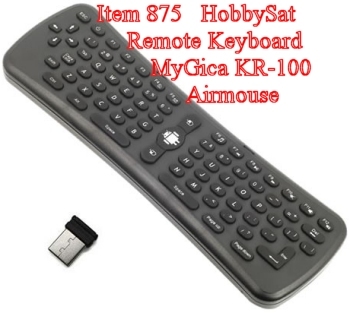 With the KR100 Keyboard remote you are able to fully control and turn on/off any MyGica Android box using its IR sensor. Works on XBMC and Kodi. Perfect for Windows PC, Mac, Pad, Android TV Boxes, STB, IPTV, Google TV Box, Playstation, XBOX, computers, TVs etc. Hard for us to keep MyGica stuff in stock. Now they come out with this. Wow! This is flying off the stores as it is what everyone needed! The MyGica KR-100 Wireless Remote and Keyboard is now sweeping the streets and ready to dazzle! Just plug the USB Wireless Dongle into your Android Box, laptop, computer, IPTV. Works with all media players. All MyGica. ZaapTV. Jadoo. Computers. Laptops. Notebooks. Tablets. Shava. BTV. maaxTV. AraabTV. MyGica 120, 400, 520, 580, 582, 585, 586 ATSC, 1200, 1800 and 1900ac. Also operates other Geniatech manufactured Android boxes (e.g. Pivos/Jynxbox). Factory Replacement IR-wireless Remote Control for any and all MyGica ATV Boxes or Android boxes. →PC, Mac, Android box or some kind of internet Box. from HobbySat in person like our boxes and it works as advertised. Appreciate it guys. David Arthur: Februaray 1, 2017 Halifax, N.S. MyGica is an expert in TV products, delivering the consumer the ultimate experience of watching internet television. 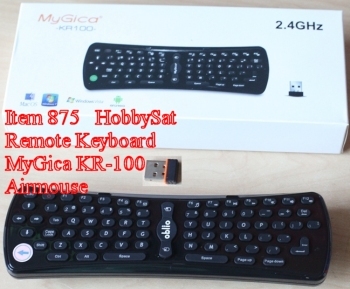 Easily navigate through XBMC or KODI with MyGica KR-100.